Is Fishing Better on a Rising or Falling Barometer? The difference between a good or a bad day of fishing can be determined by the barometer. For years, anglers have watched the rising or falling barometric pressures to predict fish movement and feeding patterns in the hopes of increasing their chances of success. Anglers often debate which barometric reading indicates better fishing conditions. Both pressure changes are ideal times to fish; your reaction to those changes affects your overall success. When the barometer is rising, weather conditions are relatively clear or improving. Fish movement becomes slightly more active. The best lures to use when the barometer is rising are brightly colored ones, such as fluorescents. 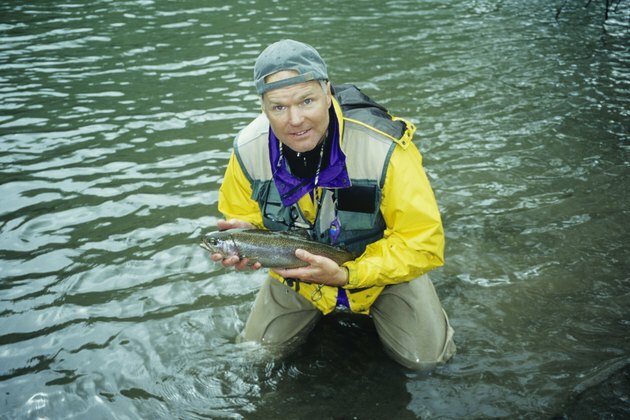 Focus on casting the lure next to cover if the fish are suspended in shallow water; let the lure sink to intermediate and deeper depths if the fish are in deeper water. After the rising barometer hits a high point, the skies are clear with overall bright light conditions. During this time, fish activity is generally slower, as the fish find cover or swim into deeper water. Use slower fishing techniques, such as vertical jigging, to attract bites. You can also use weedless hooks to cast the baits into cover where fish are hiding. When the barometer falls, weather conditions are generally getting worse, with the potential for storms. Fish react to the falling barometer with increased movement and feeding activity. Take advantage of this activity by increasing the speed of your retrieve, to cover more area. You can use crankbaits or spinnerbaits for casting over feeding areas. Focus on topwater or shallow bait presentations. When the falling barometer is at its lowest point, weather conditions are rainy and stormy. Fish patterns become less active and continue to decrease as the storm continues. After the storm, focus on bait presentations in deeper depths to attract the fish that have moved to the bottom. Use slow bait presentations, as fish are not actively feeding during times of low barometric pressure.